A special guest tells us a story! Hello, the Bears are back, after having a nice rest during our Winter holidays. We decided that this second term the Bears’ parents were going to be invited to share different activities with us. 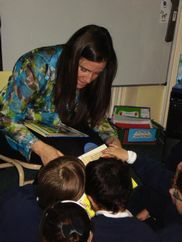 Today we started with Vero, Gonzalo’s mum, and she came to read us two lovely stories, one about a moon and the other one about a funny dog!! The children were very enthusiastic and concentrated listening to both stories; they had great fun and thoroughly enjoyed them. We thought it was a good idea to start sharing some time with mummies and daddies here at school too! Next week’s report will be about cooking!! !